Isagenix Eshots - Incredible Long Lasting, Healthy Energy! Disclaimer: These are a favourite product of the IsaElite team. We absolutely love them! Isagenix has an energy booster like no other. It’s called the e+ Healthy Energy Shot. This is great for those who need a little extra edge in their workouts (extra energy), are studying for exams (mental clarity) or don’t want the typical caffeine comedown you experience with coffee. Isagenix E Shots come in a convenient 60ml shot that gives you an energising boost to fight fatigue. The Isagenix e+ Healthy Energy Shot consists of a scientifically proven botanical blend of healthy ingredients to help you feel more energised, focused, and refreshed. The Isagenix e+shot is fantastic in the morning to kick start your day, as a pre-workout to help push through your mid workout plateaus, or as a mid day or afternoon pick me up! Caffeine sourced from green tea and yerba mate offers a healthy alternative to typical sugar packed energy drinks. Enjoy the Isagenix e+shot knowing it contains no added sugar, sweeteners, flavouring or artificial colours. Each shot can be counted on to naturally jumpstart your workout and performance without the use of artificial flavours, sweeteners, or colours. In fact, each shot contains caffeine sourced naturally from yerba mate and green tea, providing you with a mere 35 calories per serving and the fuel to perform at your best. Use the Isagenix e+shots in conjunction with your chosen Isagenix weight loss or energy/performance program. 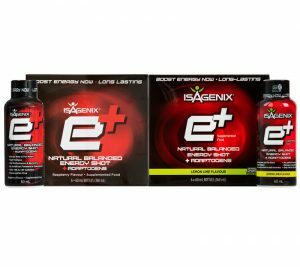 What are the Ingredients in Isagenix Eshots? The energy shot business is booming right now. However, while there are dozens of different energy shots and drinks on the market, none compare to the e+. As one of Isagenix’s most popular and easy-to-share products, it’s the perfect supplement to help build your Isagenix business!